Every Thanksgiving we gather together, family and friends, to enjoy each other’s company, give thanks and share a traditional meal of roasted turkey with all the trimmings, maybe a green bean casserole, pumpkin pie and the Grateful Dead. Er, what? Home from college for the 1970 Thanksgiving break, a friend (and former band mate) and I were discussing the benefits of various aids to digesting the previous day’s meal. Pondering our options, we concluded that drinking beer would be good, but a Grateful Dead concert would be a more entertaining alternative. 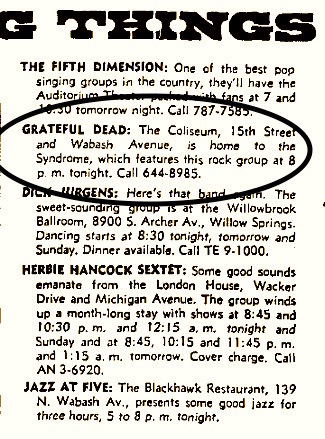 More adventurous too, as the Dead were scheduled that night in the old Chicago Coliseum, renamed the Syndrome and now home to weekly rock concerts. We took off in Mike’s VW Beetle, heading from Beloit to Chicago on the Northwest Tollway, then wound our way around some dark city streets to the decrepit, aging venue where our senses would soon be flooded by a barrage of music and lights. Upon locating some questionable street parking, we locked the VW and meandered to the box office, paid our admission and filed into the building, grabbing seats on the dirt floor with the other Deadheads. A few devoted fans, or perhaps they were members of the band’s road crew, stepped lightly through rows of crossed legs and tie-dyed shirts, distributing “party favors” among the enthusiastic audience. At concert time, the house lights dimmed and an opening band, the New Riders of the Purple Sage, kicked it off with a country-folk sound that included pedal steel guitar, masterfully played by Jerry Garcia of the Dead. It was a mellow, easy-going noise that morphed into electric music with more Grateful Dead band members joining in. Their finale, and highlight of the NRPS set, was a country-laced cover of Honky Tonk Woman that had everyone up and dancing. The metamorphosis completed itself with remaining Dead members plodding out to the stage, taking up their instruments and blasting out the opening chords to Casey Jones. For the next few hours, we were blown away with music ranging from deep rhythm and blues to soaring psychedelia. When the final strains of Turn On Your Lovelight reverberated through the hall, a thousand or more fans were on their feet, dancing and spinning to the music and lights. It was a psychedelic experience to be sure. When the concert ended, I volunteered to drive home. That return journey would have been routine save for the VW’s brake pedal unexpectedly failing as the car hurtled toward a toll booth. Mike, sleeping soundly in the back seat, was of little help. Coasting through an open toll gate, it dawned on me to pull up on the hand brake. The Beetle came to rest about a hundred feet beyond the toll plaza. Reaching into my pocket, I counted out thirty-five cents in change, stumbled out of the car and trotted back to the booth. I handed the change to a puzzled toll collector, mumbled an apology for the brake failure and scooted back to the car. Hand brake and I became close friends the rest of the way home. Every Friday after Thanksgiving, I commemorate that Grateful Dead concert by queuing up the album Live Dead, relaxing in my recliner with a set of headphones over my ears, and taking solace in the knowledge, grateful you might say, that I won’t be braking for toll booths after the record ends.